Subject: Revision of interest rates for Small Savings Scheme. 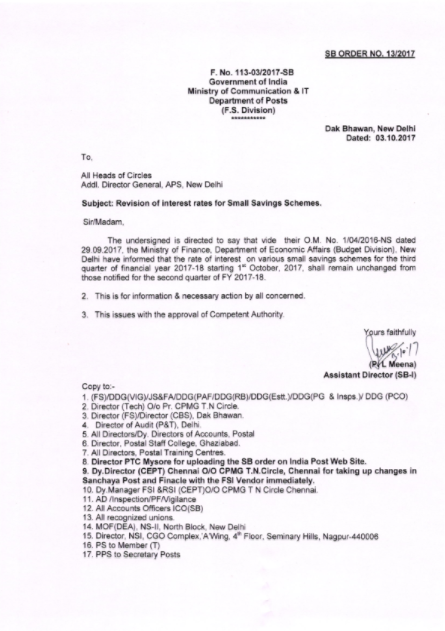 On the basis of the decision of the Government, interest rates for small savings schemes are notified on quarterly basis since 1st April, 2016. Accordingly, the rates of interest on various small savings schemes for the third quarter of financial year 2017-18 starting 1st October, 2017 shall remain unchanged form those notified for the second quarter of FY 2017-18. 8. Chief Secretaries of States/UT Governments.